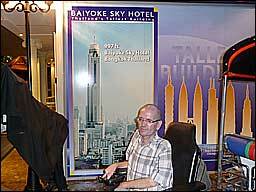 The driver takes you to the Aquarium and the Baiyoke Tower and waits for your return. Reservation of restaurant in Baiyoke Tower is recommended. Every child loves to explore the world. No matter what age, all children like water and animals. So come with us to Siam Ocean World. This is wheelchair accessible throughout. Mum and Dad can join the children to show them shark teeth, and when Dad takes the children to feed the fish, Mum can have a pamper in the fish spa. Make a boat ride to see the fish from above, walk through the tunnel to see the fish from underneath, or have a look behind the scenes. At the entrance you can buy a passe-partout ticket for snacks, drinks, photographs and tours, etc. Afterwards we take you to Baiyoke Tower, a giant look-out of 83 floors with a magnificent 360 degree view over Bangkok. Have dinner on the 78th floor, take a look outside on the revolving balcony and learn more about big towers all over the world. Unfortunately there is no wheelchair accessible toilet. 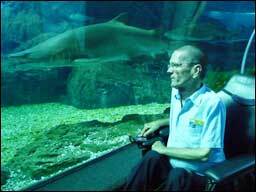 Wheelchair accessible toilets available in Siam Ocean World or in Siam Papragon shopping center. A truly wonderful day out for the whole family. Everyone will enjoy this trip. Departure preferably around 10am. Departure to Hua Hin around 7pm. Siam Ocean World, Walking Tour.